Gaming In Black and White: What Does 100,000,000 Mean To You? Could it be the number of breaths you take in your lifespan? The average times a hummingbird beats it's wings in a year? Number of pencils sharpened daily by elementary school teachers? Well, it's possible it's all of those things, but in today's post the number 100,000,000 stands for how many Nintendo DS games have been sold in Japan alone. Normally that's an astounding number, but what's even more amazing is that only 922 DS games have been released over there and 21 of said games were multi-million sellers. The Japanese truly have a love for their DS games apparently. DS Fanboy wrote up a neat little list that shows the highest selling games in Japan. 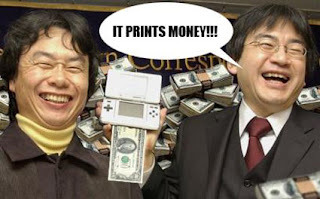 Yet again we hear the tired joke....it prints money.